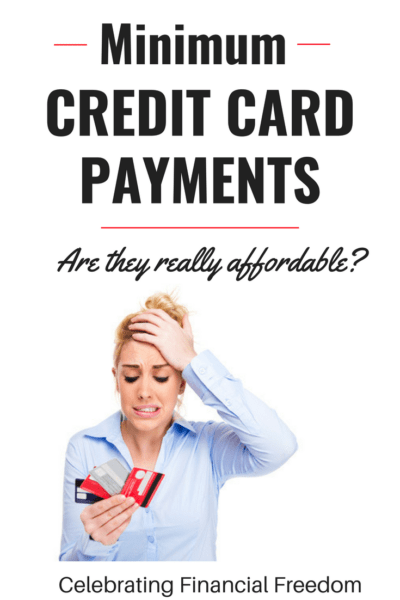 You are here: Home / Debt / Credit Cards / Minimum Credit Card Payments- Are They Really Affordable? Minimum Credit Card Payments- Are They Really Affordable? 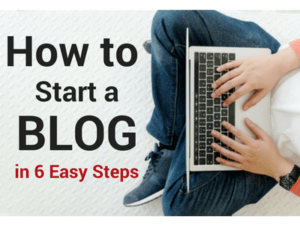 Minimum credit card payments– are they really an affordable way to pay off credit card debt? In today's article I'll show you why paying the minimum payment on your credit cards is a fool's game. It keeps you in perpetual debt for years, if not decades. Read on and get the sad scoop. Bridging the gap between paychecks. To earn rewards like hotel points or air miles. To help maintain a good credit score (a good credit monitoring service helps you keep track of your credit automatically). Whatever your reasons for using the demon plastic (by the way, I HATE credit cards), I want to tell you about a little trick that the credit card companies use that seems innocent at first, but is designed to keep you in perpetual debt. It’s called the minimum payment. Some people see it as a convenience that credit card companies provides as a guideline for how much to pay each month. But when you look deeper, you understand that minimum credit card payments are a terrible deal. The majority of credit card users carry a balance from month to month. Many of these people believe that the minimum payment is their friend. They believe that as long as they can afford the minimum payment, everything is ok. But as you'll see below, it's a trick that credit card companies use to make more money and keep you in debt. How Much Does a Credit Card Really Cost You? Too many consumers manage their credit card debt according to the minimum payment. If the payment gets too high, they cut back on using the credit card. Then they pay down the balance to get the minimum payment back to an affordable level. That brand of money management seems to make sense to a lot of people in our “how much is the payment?” society. So let’s find out the truth about minimum payments. First, let’s assume that your household is an average American household. The average credit card debt per household with credit card debt in 2018 is $9,100. Let’s also assume you have an average APR (Annual Percentage Rate) of 12.78% on your credit card debt. 32 Years to Pay Off a Tank of Gas? Now let’s break out the handy dandy Credit Card Payoff Calculator in the graphic below from my friend Todd Tressider at Financial Mentor. If you make easy, affordable, minimum credit card payments, it will take you 381 months (32 years! ), to pay off your balance, assuming you NEVER use your credit cards again during that time. 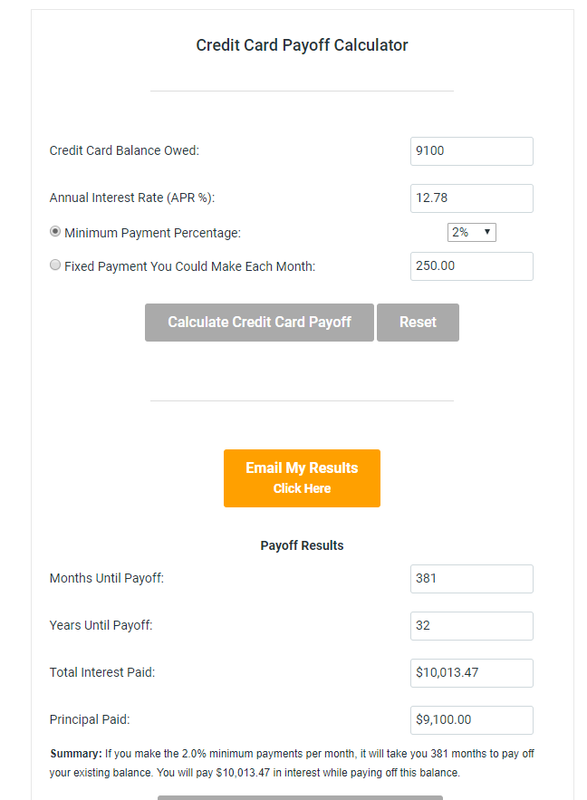 You would have paid off the entire $9,100 in credit card debt plus $10,113 in interest for a total of $19,213. For all that stuff you paid for with those credit cards, you ended up paying more than DOUBLE the actual cost. That’s 32 years to pay off those happy meals and latte’s. 32 years to pay off the cute shoes and gas for the car. This, my friends, is STUPID! If you’re paying minimum payments on your credit card debt, or if you’re using credit cards at all, you have to wake up at some point and realize the credit card companies always find a way to keep you in perpetual debt. That is their job, and they do it well. You have to get away from the “how much is the credit card payment?” mindset and start asking “how much is this going to cost me?”. When you start realizing just how much credit costs you and the lengths credit card companies will go to to keep you in perpetual debt, you’ll run away from them faster than Usain Bolt running the 100 meters! Remember, using cash is always the best deal out there. Being debt free is the best financial plan for you to perpetually succeed with money. 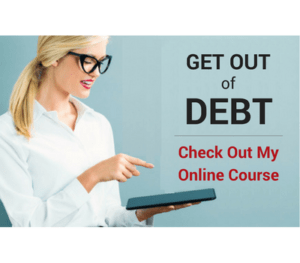 If you’ve decided that it’s time to chuck the credit cards for good, you may want to check out my Celebrating Financial Freedom online course. 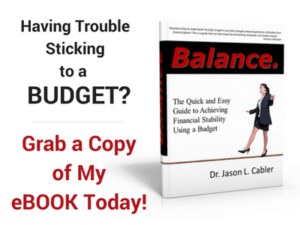 You'll learn how to take control of your cashflow and put together a get out of debt plan that you can stick to. You’ll never have to deal with those easy minimum payment demons ever again! Minimum credit card payments are not as affordable as you think. Why paying the minimum on your credit card debt never lets you pay it off for good. “You have to get away from the ‘how much is the payment?’ mindset and start asking ‘how much is this going to cost me?’. ” That is an excellent way to change our mindsets when it comes to any type of debt. We could even use this for mortgages and students loans. In the long run it costs so much more than we even realize. Those are some crazy figures, thanks for telling it like it is. When it comes to debt, if you start asking the right questions you quickly begin to realize that that debt can make you poor in a hurry. Most people just don’t realize how those numbers add up. If they did they’d never sign up for any debt.